Two fools in love: Chapeau! Gesundheit! I don't think that I'm the chapeau-type of girl, but boy if I were! 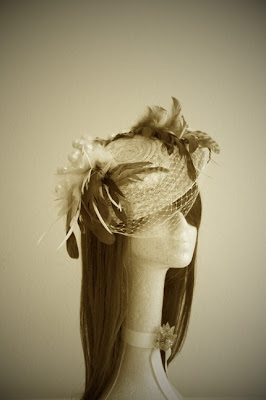 Check out this feathery fiesta from Etsy seller Sharon. For all you moms and older folks out there (or me), Etsy is a mecca for crafters and artists. It's easy to get lost in it for hours, as I did. But look at all I found! Love, love love. 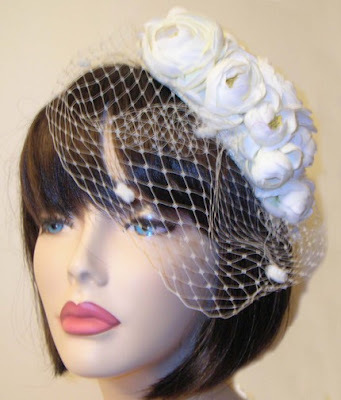 I wonder if there's a way to have the best of both worlds: the birdcage veil and some sort of traditional veil on the back. That might be too much. 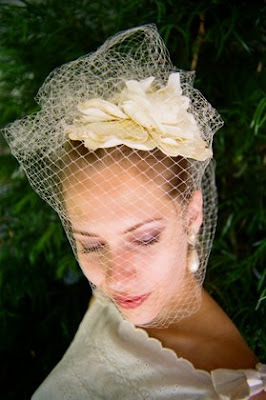 Could you possibly wear a traditional veil for the ceremony and a birdcage veil for the reception?? ?idea.